"BCS Electrics use thermographic imaging which spots potential problems before they become hazardous. Saving both time and expense in the long-term." Thermographic imaging uses a specialist camera which picks up light spectrums otherwise invisible to the naked eye. 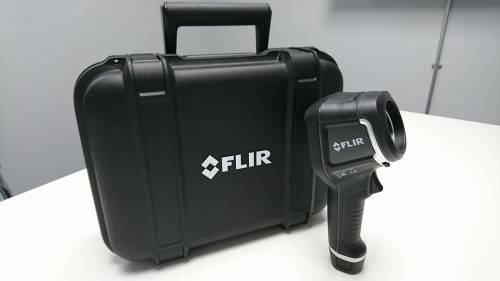 Using infrared radiation, the camera equipment produces an image which identifies hot spots in wall cavities, ceilings and floors. Where distribution boards have loose connections or overloaded circuits, thermographic imaging highlights problem areas which could lead to electrical fires. With regular testing, thermographic imaging spots potential problems before they become hazardous. Keeping your staff safe, your building and contents intact. Saving both time and expense in the long-term. To coincide with the Electrical Installation Report (EICR), we arrange a time to test when demand on circuits is at peak usage. Often in the morning when the loads on circuits are at their heaviest and when the most accurate report can be obtained. Our electricians then have the data which gives us a better assessment to recommend implementing maintenance or services to prevent future problems. Opting to include thermal imaging as a standard part of electrical testing can prevent future downtime and a resulting drop in productivity levels, as well as providing more detailed information to insurers which could be financially beneficial. If thermographic imaging would give you peace of mind that your building is safe from hidden electrical dangers, get in touch with the BCS Electrics team on 0113 235 0400.